From the author of Neverness comes a powerful new epic fantasy series. The Ea Cycle is as rich as Tolkien and as magical as the Arthurian myths Valashu Elahad rescued the Lightstone from the dark hell of the enemy's own city, only to have his triumph overturned. Once more the Lord of Lies has the sacred gem in his possession and its power is invincible. Val burns with shame. Treachery surrounds him. 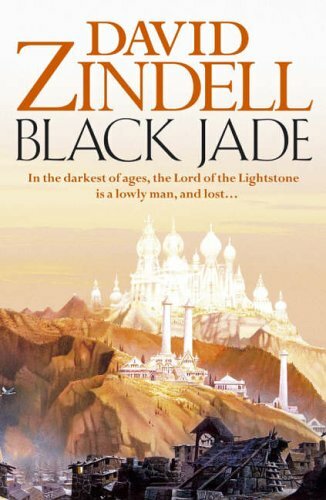 His only hope is the Black Jade that lies buried in the heart of a cursed and blighted forest, forgotten since the War of the Stone. Through this, the greatest black gelstei ever created, Val will seek to understand the darkness inside himself so that he can use evil to fight evil. If he does not, the world will fall into final corruption as the Dark Universe of the Lord of Lies. In either case, evil prevails. But Val must risk everything, even his soul. The stakes are too high for anything less. Val is the Guardian of the Lightstone until a new master is made known, that person who will rightfully wield its power. Should Val find the sacred gem and take it for himself, he will become a new Red Dragon, only mightier and more terrible than the Lord of Lies.